362 pages | 98 B/W Illus. 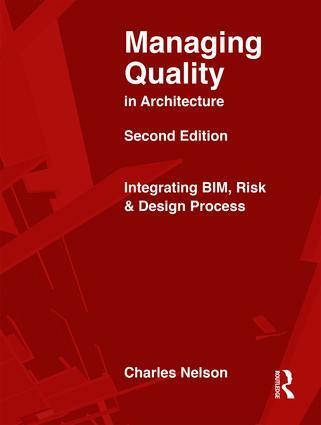 Completely revised throughout for this second edition, Managing Quality in Architecture addresses the new ISO 9001 standards after the significant 2015 revision. ISO 9001 is the global standard for quality, and firms certified under the 2008 edition have three years to upgrade their quality systems to the new Standard. This book helps architects, engineers and other designers working in the built environment to develop appropriate quality systems that meet the requirements of the international Standard. Importantly, the 2015 Standard integrates risk management with quality, something that earlier versions did not. Risk is an extremely important factor in professional design practice, and this important element is fully explored in the new edition. Similarly, the role of BIM in quality management is addressed as an integral part of practice. International contributions from the USA and Australia provide expertise in each topic, and case studies from the USA, Japan, Australia, New Zealand and the United Nations Office of Project Services provide easy-to-follow illustrations of the important areas to understand. The focus is completely practical, rather than theoretical, affording readers a concise picture of how the issues of excellence and quality performance flow across every aspect of design practice. Foreword Gordon Nuttall. 1. Surviving & Thriving in a Swiftly Evolving Professional Environment. 2. Why Quality? 3. Lessons from the Leaders – Case Studies in Quality. 4. Creating Efficient, Effective Quality Systems.5. Harnessing the Power of ISO 9001. 6. Vision, Leadership, Planning & Brand. 7. People. 8. Integrating BIM, Risk & Design Process. 9. Business, Connectivity & Marketing. 10. Project Quality: Techniques that Deliver Results. 11. Pushing the Envelope: The Future of Practice. 12. Appendices. Shift happens: The missing chapters. Quality acronyms & terminology. Related ISO Standards. MQIA website | AIS epilogue. Index. Charles Nelson, an American architect with a half-century of diversified experience, moved to Australia in 1984. Australia’s foremost provider of ISO 9001 systems to building design professionals, and the author of McGraw Hill’s 1996 book TQM and ISO 9000 for Architects and Designers, Charles is internationally recognized as an authority on the application of ISO 9001 to the design professions. He is the author of quality management sections in the American Institute of Architects' Architect’s Handbook of Professional Practice, 13th edition, and its Update 2003. He is also editor and author of Managing Quality in Architecture: A Handbook for Creators of the Built Environment, published in 2006 (Elsevier). Charles served on the American Institute of Architects Practice Management Advisory Group 1999–2004, and was the 2003 Chair. He has written several continuing education programs, including its Risk Management course, for the Royal Australian Institute of Architects Education Division, and he is past chair of the Professional Development Committee, RAIA Victorian Chapter. Charles has presented over 100 full-day workshops on quality management over the past 25 years, and many conference seminars on risk management, project management, strategic alliances and design management. He has presented workshops on design and construction quality management at 12 annual American Institute of Architects National Conventions.